Six years ago, I pulled into the Cracker Barrel parking lot in Clermont, Florida to meet my maternal grandfather for the first time. He was taller than I expected and had a high hairline (damnit), but was otherwise fairly normal. I also learned, over the course of our conversation, that he was of French heritage. I was surprised, never knowing that I had any French “blood.” Sometime later, my mother found old family-tree documents from her mother’s side that told us of more French affiliation in our veins. While I thought the connections were cool and enjoyable, I still didn’t have a particular affinity for France. For all I heard, it was a place where people were lazy, crude, and unkind to foreigners, while also somehow being a place for lovers and wine. In my mind, it remained somewhat undefined. I was in the British Isles for two weeks visiting some friends and decided to take two free days to explore Paris. A friend-of-a-friend agreed to let me sleep on his couch in the 11th arrondissement and I took to adventuring through the city. The first thing I did was start walking for the famed Montmartre and Sacre Coeur, the gorgeous cathedral at the highest point of Montmartre. I walked the steps up and looked out from the 18th arrondissement on the whole of Paris with astonishment. The city began to take shape in my mind. I decided to—against my judgement—pay the cathedral money to be able to climb the steps to get to the main dome, approximately 250 feet up. That trip, however, turned out to be priceless. I entered the spiral staircase of one of the lower towers and wound my way up the slick, now-concave stone steps to get to the bottom of one of the roofs. Like Quasimodo and countless priests before, I walked along the bottom edge of that pitch until i reached the middle of the building and the outside of the main dome. I followed the stairs that ascended with the pitch of the roof, until I reached it’s pinnacle. I had now only to go in the door for the main dome and ascend another smaller set of stairs to make it to the main observatory station. But I stopped, turned and looked out upon the city. 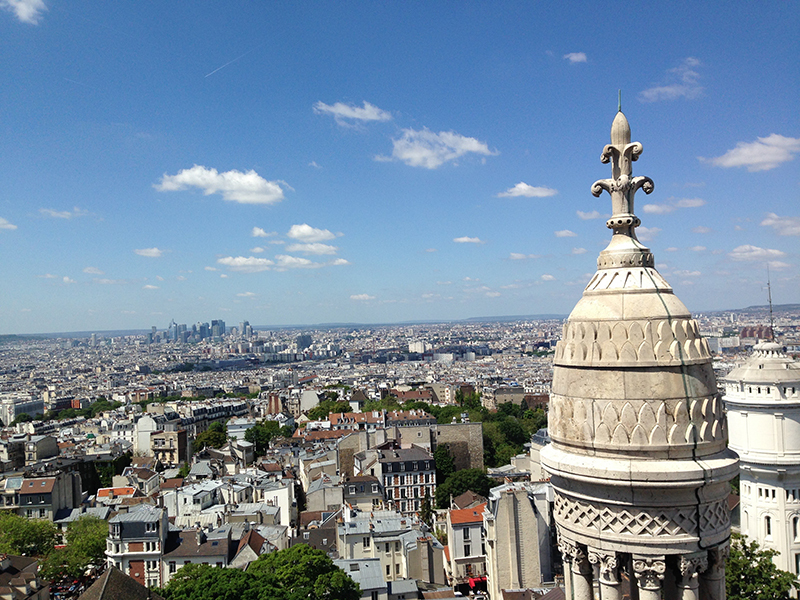 Even though the view from the foot of Sacre Coeur was incredible, the current view was mesmerizing, markedly better. After a few moments, I turned to the building and—instead of entering the doorway and ascending the last 75 stairs or so, I grabbed a ledge and hoisted myself up, crouching there like a gargoyle standing watch over the city. At that moment, something overtook me. It wasn’t the beauty of the city, which was ever-present. It wasn’t the majesty of the view, which was clearly evident. It was something deeper. Something, maybe, spiritual. I felt an otherwise-unexplainable connection to Paris on a deep, visceral level. Maybe to my ancestors. Maybe to the undercurrent of culture hovering under the surface of the place. Maybe both. But I know that the feeling existed in a way I could not deny. I stayed there staring for an interminable amount of time, taking in the emotion, taking in the city. 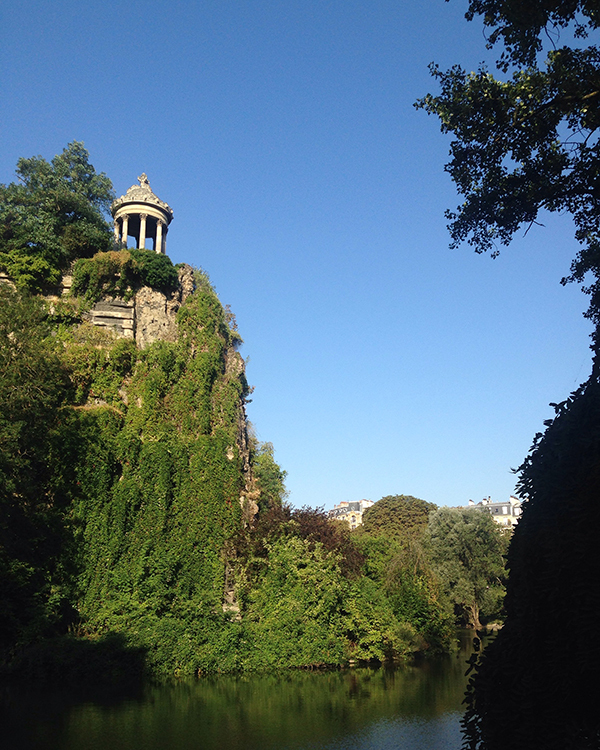 By the time I left Montmartre and swam into the rest of the city, in-and-out of cozy cafes and around-and-through local parks, my heart was won over. What I found was not a place full of insubordinate people unwilling to think of others but a place where people—though they are generally introverted—care massively about others, about principles, and about the good of mankind. Yes, they have distaste for those who devalue those things, either directly or by way of blindly touring through the culture without seeing the deeper values. And so, they make rules that honor those things they cherish, they revel in beauty for the sake of beauty, and they appreciate the joys of life—in general. For me, the place is a model for other cultures to take note of. So while it’s true that I may call my affinity for France something new; it is, at the same time—somewhere deep in my heart—something I already felt, long before.